My best friend and I always go all out at Halloween. We think it is so fun to take a small object, make it huge, and wear it with pride to Halloween parties. These lego minifigures are approx. to scale. My friend found the measurements of a true minifigure and scaled them up to human size. We had what looked like a blueprint before we started measuring and cutting! We used foam wreaths, posterboard, and spray paint for the lego heads. The upper bodies are made out of cardboard, covered with posterboard, paint, and tape. The legs are made of styrofoam covered with posterboard. 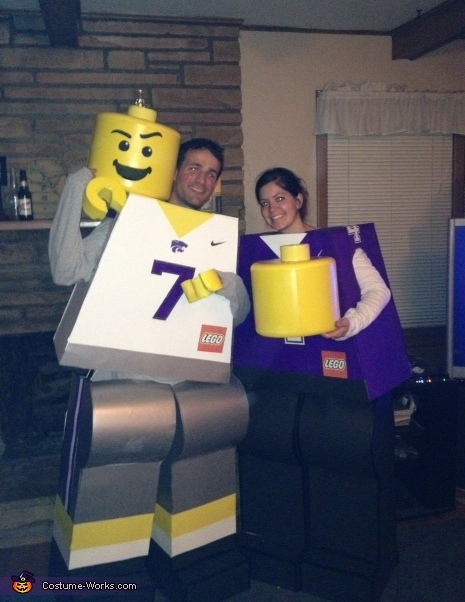 The white KSU Lego man is "Optimus" Collin Klein, the current Heisman candidate, and the purple Lego man is his biggest fan. The "pennant" is made of foam and posterboard and is detachable. We hope you like them! Took approx. 40 hours to make and well worth it!